This property is 3 minutes walk from the beach. 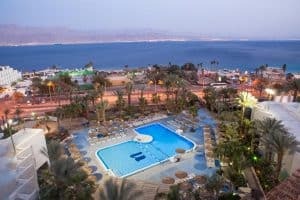 Offering a private beach, swimming pool and wellness centre, U Coral Beach Club is set on the shores of the Red Sea in Eilat. There’s something for everyone, with a mini club, activities and entertainment. Rooms are air conditioned and feature cable TV and a minibar. They also include a sofa bed and an en suite bathroom with shower and hairdryer. 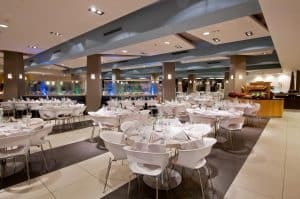 U Coral Beach Club offers a full-board service with gourmet meals served at breakfast, lunch and dinner. Drinks are available from the bar and there are plenty of outdoor tables, chairs and comfortable sofas. 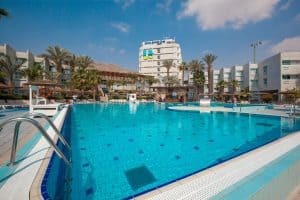 Guest can also enjoy the beach bar and the poolside bar, as well as the non-kosher Beach Restaurant, providing a wide range of seafood and other specialties. The wellness centre includes a gym, sauna and massage rooms. You will also find a tennis court, children’s playground and water sports equipment for windsurfing, scuba diving and snorkelling.